When Laudato Si, Pope Francis’ encyclical letter on the environment, appears on June 18, it will seem obvious to most people who the patron saint of the document is: St. Francis of Assisi, the great 12th- and 13th-century lover of all creation, whose famed “Canticle of the Sun” gives the text its title. On Thursday, however, Francis provided an indirect clue that there’s another strong candidate as the patron, someone much closer in time though not yet formally declared a saint: Sister Dorothy Stang, an American missionary nun assassinated in Brazil in 2005 for defending the Amazon rainforest and the rights of poor farmers. 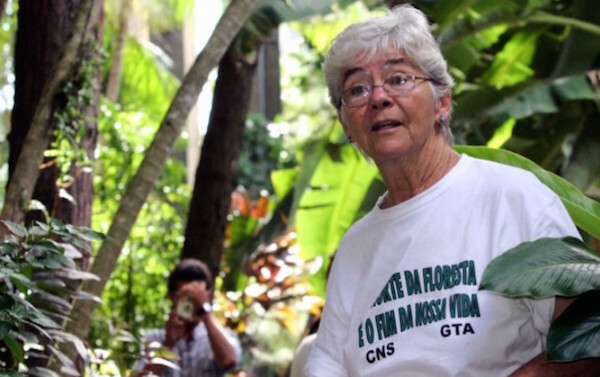 Sister Stang is known today as the “Martyr of the Amazon,” and the cause for which she laid down her life seems set to form a central component of Francis’ environmental agenda. In remarks to the United Nations Food and Agriculture Organization on Thursday, Francis said that climate change is not the only ecological danger and warned that increasing reliance on biofuels is also dangerous when it supplants food production and exacerbates global hunger. No doubt the Latin American pontiff was thinking in part of the Amazon, where biofuel production is both driving a new wave of deforestation and reducing the land devoted to food crops. According to Oxfam International, in 2012 the amount of crops consumed as biofuel by G8 countries, most of it produced in Brazil and Indonesia, could have fed more than 441 million people for an entire year. Francis’ speech to FAO suggested that deforestation and the link between environmentalism and hunger will be a major concern of Laudato Si. In contemporary Catholic history, few figures are more associated with those issues than Sister Stang. In her day, biofuels were just coming on the horizon. The main threat to the Amazon came from large-scale ranchers, who ruthlessly drove farmers from their lands in order to clear them by burning, often buying off police and judges to look the other way. Sister Stang was one of the few foreign missionaries in the area, and the defense of the forest became her life’s work. Sister Stang grew up in Dayton, Ohio, joining the Sisters of Notre Dame de Namur at age 17 with dreams of serving abroad. In 1966, she left for the city of Coroatá in Brazil, where her first assignment was to educate local farmers with no formal schooling. When large-scale deforestation began in the 1970s, Sister Stang moved to the town of Anapu, described at the time as the “Wild West” of the Brazilian Amazon. Sister Stang would camp outside police stations and courthouses, demanding that the rights of her people be upheld. At one point, local ranchers put a $50,000 bounty on her head. Her time came in February 2005, when a powerful local rancher ordered that the houses belonging to 12 farmers be burned down near the town of Esperanza — which, interestingly, means “hope.” Sister Stang organized a meeting to encourage the farmers to stay put. She invited gunmen working for the rancher to attend, trying to persuade them to reject violence. According to the later testimony of one of those gunmen, Sister Stang walked with them to the meeting, showing them the land that belonged to the farmers on a map. Obviously unmoved, they shot Sister Stang seven times, leaving her dead body along a muddy forest road. She was 73 at the time, having served in Brazil for 39 years. Her story is a powerful reminder that Laudato Si won’t just drop out of a clear blue sky. The ground for the pope’s environmental manifesto has been prepared by the witness and courage of scores of Catholic thinkers, pastors, and activists, and few put more on the line to make it possible than Dorothy Stang.